Apparently once Isinbayeva crested 5 feet, her chances of becoming an Olympic gymnast became rather slim. Indeed, female all-around champion Gabby Douglas stands a mere 4’11” – and she’s actually tall in comparison to the 4’9” average height of the Chinese women’s team. Other sports are exclusive on the opposite extreme. Imagine being a swimmer trying to reach the wall ahead of 6’1” Missy Franklin or Michael Phelps’s 6’7” wingspan. Basketball players, volleyball players, rowers, and countless other sports filter out hopeful participants through prohibitive size and strength requirements. And then there’s distance running, which is pretty much open to anyone who wants to try it. This may sound odd at first, as conventional wisdom usually holds that runners should be small and skinny, but a closer look at world class athletes tells a different story. Just like recreational plodders, elite runners come in a wide variety of heights, and it’s unlikely that someone’s stature should ever disqualify him or her from competing. Consider female marathoners. In the 2000’s the sport was dominated by Kenyan Tegla Loroupe, who stands barely five feet tall and might weigh 90 pounds dripping wet. However, Loroupe isn’t the world record holder; that honor goes to 5’8” Paula Radcliffe, an indomitable force who represented Great Britain at four Olympic Games. The men’s marathon record is held by 5’5” Patrick Makau, but for many years it was the property of 6’ Paul Tergat. The record books of most major marathons will show an even wider range: the shortest champion in the 116-year history of the Boston Marathon is 5’1” Yun Bok Soh of South Korea, who is more than a full foot shorter than the tallest winner, 6’3” Kenyan Robert Cheruiyot, who won the race four times in the last decade. Last weekend’s men’s 10K gold and silver medals weren’t won by tiny African runners, but by 5’9” Mo Farah of England and 5’11” American Galen Rupp. The US record holder prior to Rupp was 6’1” Chris Solinsky, whose best 5K time is slower than 6’3” Craig “Buster” Mottram of Australia. And if Buster ever lined up against America’s best 1500m runners, he’d be two inches shorter than 6’5” Andrew Wheating. Incidentally, one of Wheating’s 1500m teammates in London is 5’5” Leo Manzano. Do you still think height makes a difference for speed? Even over extreme distances, smaller isn’t necessarily better. One of the brightest talents in ultrarunning is 5’7” Kilian Jornet, but his accomplishments pale in comparison to 6’3” Scott Jurek, who won the brutal Western States 100-Mile Endurance Run a record seven times. Granted, many world-class distance runners are remarkably skinny: Buster Mottram carries only 160 pounds on his 6’3” frame, and Cheruiyot is even more slender at 150lbs. Galen Rupp looks like he might snap in half if you hug him forcefully. However, this is one of those chicken-and-egg scenarios that’s difficult to quantify. 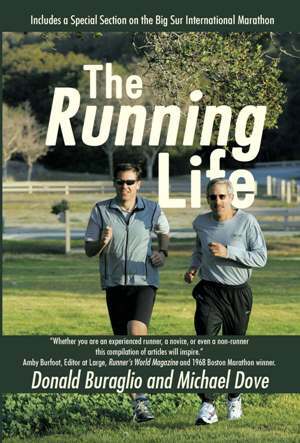 Are they elite runners because they are naturally skinny, or are they skinny because of all the miles they’ve logged to become elite runners? The answer isn’t that important; what’s more critical to realize is that there’s virtually no body type that’s unsuitable for running. In other words, don’t worry about what you look like – just get out there and do it!
" Champions are made when no one is watching." - Author unknown. When Adam Roach of Pacific Grove crossed the finish line first at this year's Big Sur Marathon, the entire community shared and celebrated his accomplishment. What none of us saw, however, were the months of hard work he put in while no one was watching in order to make his triumphant day possible. We spoke with Adam recently to ask about his training for this year's race. His responses highlighted some lessons that anyone can benefit from - even those of us who finish many minutes (or hours) behind him. Adam is 28 and works full time, so he fits running around his work schedule and family time just like the rest of us. He usually runs after work each week day and on weekend mornings, averaging about 80 miles per week in the springtime - a volume that is far lower than the 100-120 miles that many professional runners log. On Wednesdays, Adam hits the Pacific Grove High School track to run intervals at race pace. Sometimes the intervals are long, such as 4 x 2 miles at marathon pace, and other times they're short, such as his favorite workout of fifty 400-meter repeats at half marathon speed. Thursday is another "comfortably fast" run, Friday is a 10-mile tempo (slightly slower than race pace) run, and Sunday has 12 more "comfortably fast" miles. Consistent long runs are critical: Adam didn't have any runs over 20 miles, but he did a 20-miler nearly every week from February through April. He calls these, "The bread and butter of my training ... and the long runs over hilly terrain gave me endurance to be able to run hard for a full 26 miles on race day." These runs were bolstered by the long interval and tempo run workouts, which helped him to stay comfortable while running at race pace. Discipline and toughness: Did any of those track workouts sound difficult to anyone? How about a weekly 20-miler? Or running every day for a minimum of 10 miles? You can't do these things without enormous self-discipline - and each progressive session builds increased confidence, toughness, and mental strength that will be needed to race off the front of the pack on race day. Focus on the goal: Adam's race schedule was minimal, and his entire training program was designed solely to prepare him for Big Sur. He ran the Mission 10-Miler in San Juan Bautista in January and the Santa Cruz Half-Marathon in March, and otherwise stayed focused on his one major goal race. Just run, baby: Adam does minimal cross training, weights, or stretching, because he'd rather spend his limited workout time exclusively running. Once a week he'll do a short abs/core workout, "But nothing too crazy." Specificity of training pays enormous benefits in learning to run more efficiently. Obviously, successful training plans differ for everybody, but Adam has clearly found a system that works well for him. If you take some cues from his training regimen, you still might not win the Big Sur Marathon, but you'll almost certainly become a better runner.